Busloads of elderly South Koreans arrived in North Korea at the Mount Kumgang resort Tuesday. 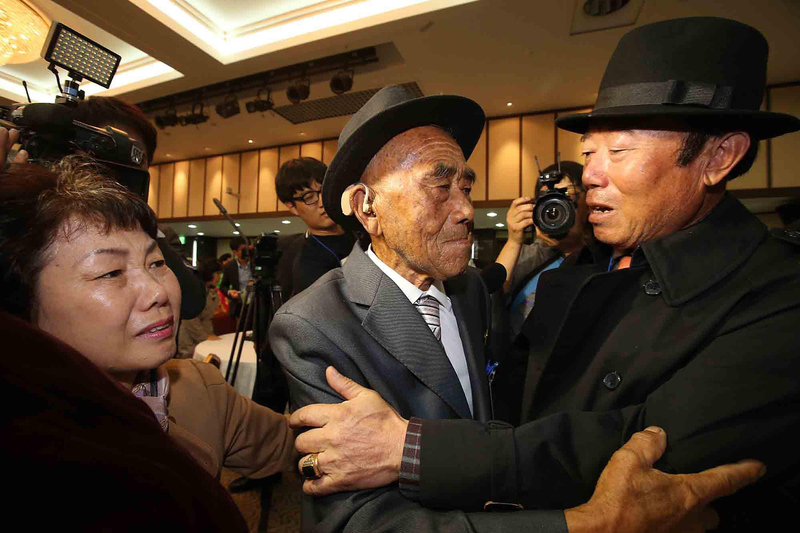 For many of them, this was the first time that they had seen relatives since the end of the Korean war, which lasted from 1950 to 1953. The reunion was one of a few that have been held since 1988, and it was only the second in the last five years. The frequency of the reunions depends on relations between North and South Korea. Photos of these reunions are both heartwarming and heartbreaking at the same time. Among those being reunited was Lee Ok-yeon, an 88-year-old South Korean who saw her husband for the first time in 65 years. Photos of the couple show Lee laughing and crying while hugging her husband, Oh In-se. Lee lives in the South, in a house that Oh built and which they shared just after their marriage. But then the two were separated by the civil war. Lee's grandson, Chae Jeong-jae, told South Korean reporters that Lee had “asked whether it was a dream or a reality” when she found out that she would be able to attend the reunions. In NBC News' video of the event, families can be seen crying, clutching each others' hands, and showing old photographs to each other. The meetings are held by the Red Cross, and they're extremely popular. Tens of thousands of Koreans sign up, hoping to finally see their long-lost family members, but only a select group from each side are chosen for each reunion, and most of them are elderly. Most of them also have to undergo interviews and medical examinations to be sure that they are fit enough for travel. Ahn Yoon-joon told CNN that he left North Korea when he was 18 years old, and that he didn't even say goodbye to his family. He was working as a teacher and fled to the South because he heard that young men were being drafted into the military. For almost 70 years, he has waited across the border — unable to visit or even write letters to his family, since there was no postal service between the two countries during war. I would ask my younger sisters to forgive me. I left them with all the responsibilities. My heart is breaking. I abandoned them. About 64,000 of the elderly been applying since the process began in 1988 have died. This round of reunions was agreed to as part of a deal between North and South Korean officials made in August, just after an exchange of artillery fire at the border that prompted both sides to step up preparations for war. North Korea is not doing this to be nice. North Korea does not give up anything meaningful without getting something in return. Citizens of both countries are usually banned from making family visits in the neighboring country, and they're also not allowed to make phone calls or exchange emails. They have about two hours to spend together at the reunion before saying goodbye again — for many of them, for the last time. Words cannot express how happy I am. I feel like I am meeting people who came back from the grave.